The building housing the Jefferson Barracks Telephone Museum was constructed in 1896 by Richard Deutman and Son, Architects to Quartermaster Plan 115 as a two family duplex. It is one of two remaining structures that was part of Officers’ Row and is located on the north side of the former parade grounds. Army officers and their families were residents of this building and the location allowed officers to oversee the soldiers marching and performing their maneuvers from the comfort of their residence. In 1909, electricity was added to the duplexes and bathrooms were installed in 1925. Sun rooms were added on the second floor and the first floor area beneath each of the new rooms were enlarged in 1938. The officers and their families moved out the duplexes in the mid-1940s. Jefferson Barracks was deactivated in 1946 and the Federal government transferred tracts of land and buildings to St. Louis County in 1950. The duplex is part of the Jefferson Historic Site and the site was added to the National Register of Historic Places in 1971. The museum, leased from the St. Louis County Parks Department, has undergone a total renovation over a period of 13 years. Members of the Telecom Pioneers, a non-profit 501(c)(3) telephone company employee service organization and their families and friends have spent over 66,500 hours in repairing and renovating both floors of the building. Each side of the duplex, on both floors, is a mirror image of each other. The doorway near the telephone pole was created by cutting through 11” of brick and plaster so both sides of the duplex could be accessed. There is a similar doorway on the second floor. The second floor is used for a variety of purposes and is not open to the public. Bob T. & Gene L. removing bricks. Ken S., Tom Y, Ed H. & Steve J. replacing decking on the front porch. Carol J., Ken S., & Bill N. replacing decking on the front porch. Installing a new slate roof. Installing four new furnaces, four new air-conditioning units and duct work throughout the building to accommodate the new HVAC systems. Installing new energy efficient windows throughout the second floor. Installing two ramps to make the museum accessible. Installing storm doors on each of the exterior French doors. Painting all the walls and ceilings on both floors. Refinishing all the wood surfaces throughout the building (including the windows, doors and floors) and repainting or staining these wood surfaces as needed. Installing new flooring when the existing flooring was too damaged to be repaired. Pouring a new concrete basement floor on one side of the building and in the garage. Enclosing the garage. Landscaping around the museum area and maintaining the appearance of the grounds. Russ S. & Bob R. constructing railings & painting. Jim B. scraping paint from exterior pillars. Harold D., Rudy H. & John S. installing a new door lock. George S., Ed H., Jim B., Bill N., Bob T. & family member renovating garage crew. Dodi S., John S., Art B., Joyce S. & Jerry S. cleaning crew-outside area. Joanne Y.,Tom Y., Betty H., Rudy H., Dodi S., John S., Jim B., Red G. & Art B. JD M presenting keys to Carol J. and the team. Bob B. is taking the picture. 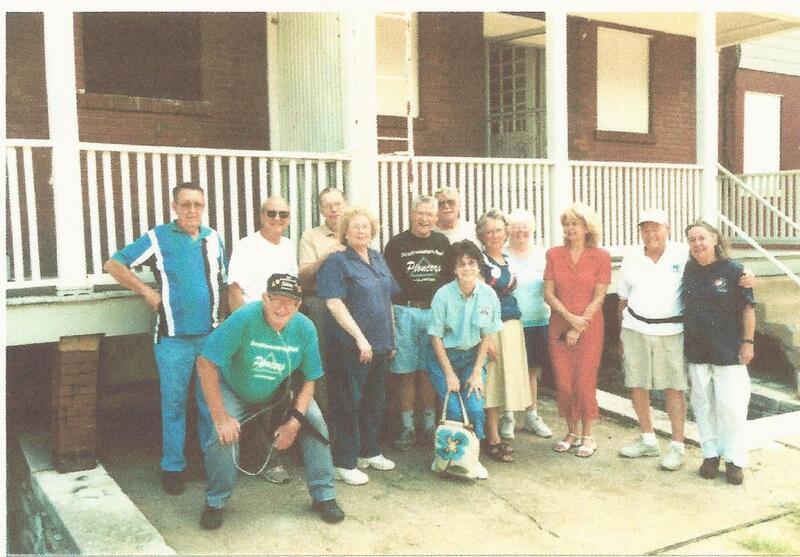 Sharon F., Conrad P., Tom Y., Bill N., Harold D., John D., June N., John S., Joan R., Jackie M., Gene L., Joanne Y. & Jim B. Museum Project Committee. The museum was created for the enjoyment and education of others and has only been made possible from the inspiration, motivation and team work from several dozen Telecom Pioneers members, their families and friends. The museum is dedicated to all who gave of their time, talent and monetary support to make the museum possible for generations to come.